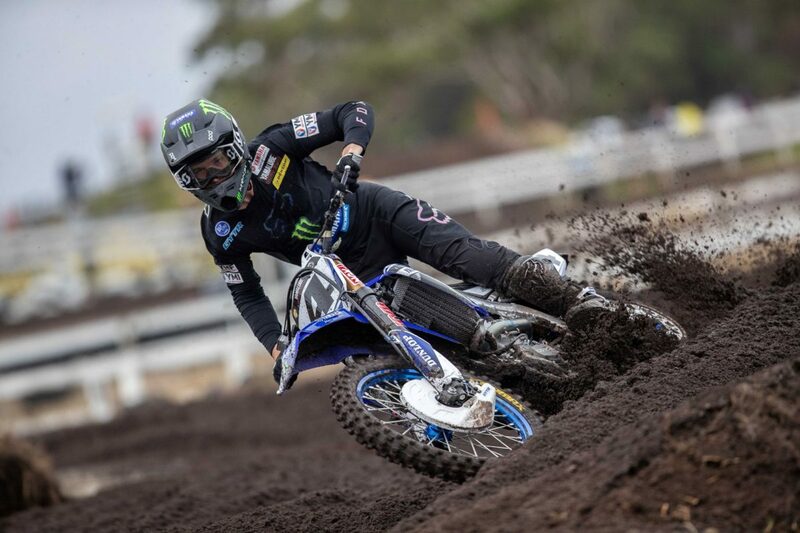 Luke Clout has broken through for his maiden MX1 round victory at a wet and gruelling Wonthaggi circuit after action at round two of the MX Nationals wrapped up on Sunday afternoon. 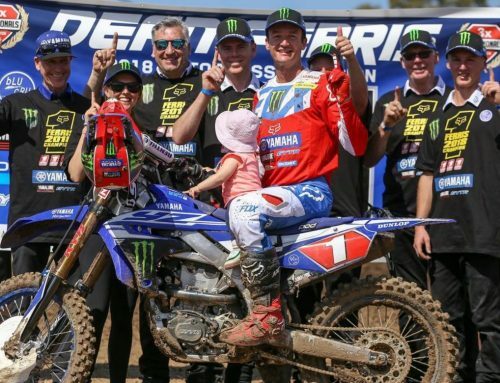 Clout, on board his CDR Yamaha Monster Energy Team, YZ450F posted 2-2 results in trying conditions to win the round and chalk up his first round victory in the premier MX1 division. But it wasn’t all smooth sailing for Clout who had to overcome time penalties in each outing to secure his second place finish in each moto and he now jumps to second place in the championship. Race one saw Clout power out of the gate only to lose traction in the wet and sloppy first turn and drop back to fifth place. He ticked of his laps and picked his way forward passing one rider at a time until he hit the lead with a lap to go. He was the first racer across the finish line at the end of the 30 minute moto but received a 10 second penalty for an on track infringement and was relegated back to second place. The second race and Clout was in a similar position on the opening lap but determined to get to the front early. He charged his way to second place and slotted in behind race leader, Todd Waters. As the race unfolded, he was issued with a 20 second penalty but despite the time issued, he was able to maintain his second place by race end and was awarded the round victory on the back of his super consistent 2-2 results. “After all the hard work over the summer and in the pre-season, I’m so pumped that I was finally get a round win in the MX1 class,” said an excited Clout from the podium. 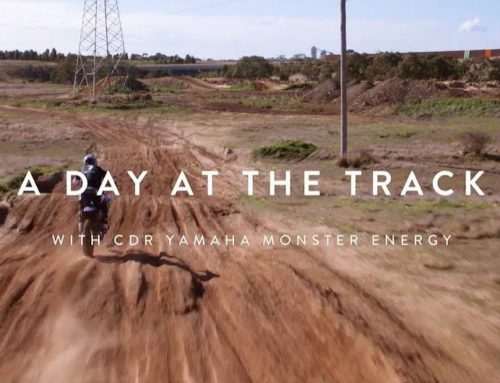 “The day wasn’t without its challenges, both on and off the track, but as a team we were able to get it done and I’m thankful for the efforts everyone at CDR Yamaha Monster Energy team have made. “The track was thick and heavy today and staying upright and carrying speed was the key. The first straight and turn was so slippery and getting through there was half the battle as track position was so important. It was also a good test of my fitness as two long motos in these conditions are tough. “The plan is now to keep the momentum rolling for the next round and continue to climb my way back into championship contention,” Clout ends. Round two proved to be a frustrated and challenging day for team mate, Kirk Gibbs. 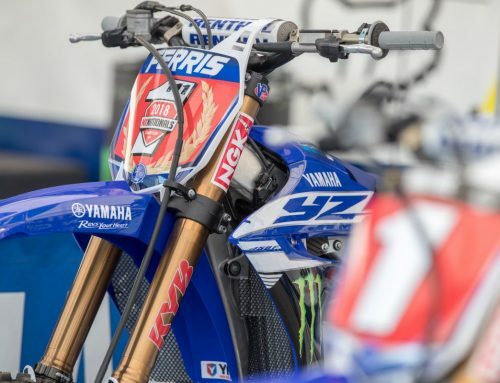 Gibbs was in the wars seconds after the gate dropped in each moto and was involved in first lap pile ups that left both him and his YZ450F batted and bruised. But despite the rain, the mud, the crashes and the lack of vision, Gibbs battled on bravely to come home with 8-7 results and claim fourth for the day and control the points damage, somewhat! “It wasn’t a great day for me and I leave here pretty frustrated and angry,” Gibbs laments after race two. “I was way back in moto one and was moving forward when another rider went down and took me with them and I lost plenty of time there and then in the second one I went down at the start, had to stop into the mechanics area to get the bike straightened out and was a long way behind the field when I re-joined the race.